Baracoa, Cuba’s oldest city, is perfect for independent-minded travelers seeking somewhere just a little bit different. It has an atmosphere all its own. One as haunting in its fantastical unfamiliarity as it is enchanting in its beauty. The town’s setting seems fit for a Hollywood epic. 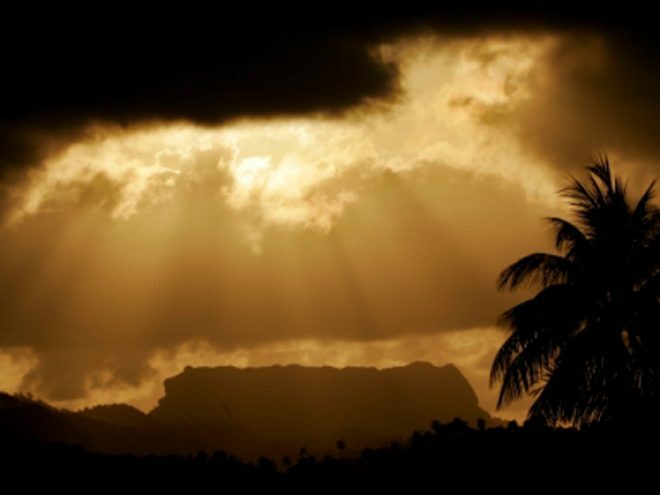 Baracoa spreadeagles below a dramatic flat-topped formation – El Yunque (the anvile) – that floats mysteriously above the surrounding hills, forming a great amphitheater flowing down to the Bahía Miel (Bay of Honey). Baracoa’s beauty is never more evident than at dawn and when viewed from the Hotel El Castillo, which occupies a former fortress – Castillo Seboruco – constructed in the 1730s atop a promontory that separates the bay from the roiling ocean and offers a bird’s-eye view over town. Below, tiny red-roofed wooden houses are cloaked in shadow. Dawning sunlight glitters upon the waters, and a rubicund radiance mantles the mountain meniscus. El Yunque glows like hot coals. Sun-reddened mists pour down from the jagged palisade. As the sun rises above the horizon, it ignites the rusting fishing boats and rings the spindly palm tops with saffron. Burning sunlight splashes the rooftops with methyl violet and fiery vermilion, and for a moment it seems as if the Lilliputian town is ablaze. Then the tropical sun shoots upward and the sublime conflagration is extinguished with magical swiftness, leaving only a chimerical memory of the evanescent enchantment of Baracoa at dawn. The town was the first of seven villas founded by Diego Velázquez de Cuellar, the first governor of Cuba. Looking quite dapper in his plumed hat and velvet cloak tufted with gold, Velázquez had arrived in 1511 and established La Villa Nuestra Señora de la Asunción; from there he set out to conquer the rest of Cuba. Local cacique (chieftain) Hatuey led an ill-fated Indian resistance to Spanish brutality before being burned at the stake. The Indian hero is honored with a bust that rests upon a whitewashed concrete pedestal in a corner of Plaza Independencia – a compact, triangular park colloquially called by its old name, Plaza Cacique Hatuey. An uphill stroll from town to the Museo Arqueológico, where Indian skeletons lie curled up in a funerary cave. To learn about local history, head to Fuerte Matachín, guarding the eastern approach to town. Inside, the Museo Matachín makes a bold claim that Christopher Columbus first set foot on Cuban soil here, and that El Yunque was the “high, square-shaped mountain” he described on October 27, 1492 (experts believe he was describing a similar mountain near Gibara). Locals point to the “Cruz de la Parra,” a dark, well-worn, metal-tipped cross in the cathedral on Plaza Independencia said to have been brought from Europe by Columbus. Carbon dating indeed confirms its antiquity, although the wood is actually native to Baracoa. Because Velazquez’s Spanish villa was remote and cut off by rugged mountains from the rest of Cuba, in 1517 Santiago, with its vastly superior harbor, was proclaimed the new capital. For four centuries, Baracoa struggled along on smuggling and a meager cocoa trade. On the eve of the revolution, the town still languished in limb, with no road or rail link to the rest of Cuba. After Castro came to power, Baracoa’s status changed significantly, when a long-touted highway – La Farola – was finally completed, linking Baracoa with Santiago de Cuba. Still, the town looks and feels antique, with its little fortresses and streets lined with venerable wooden edifices, rickety and humbled with age, with red-tile eaves supported on ancient timber frames. It is especially delightful in the evening, when the midday heat is spent and the air more congenial for strolling the streets. Then, join the locals who assemble to watch TV al fresco (it means taking natural air) in Plaza José Martí, reminding you, perhaps, of a scene from Macondo, the surreal setting for Gabriel García Márquez’s novel One Hundred Years of Solitude. Baracoa is acclaimed for its regional cuisine, with coconut as a staple. You can snack on sweet tidbits from streetside stalls: pudin de boniato (made from sugar, coconut milk, and sweet potato); yemitas (sweet balls made with chocolate, coconut, and sugar); and delicious turrón de coco, a baked bar of grated coconut mixed with milk and sugar. Cacao is also grown hereabouts and is the source for Baracoan chocolate. The Casa del Chocolate, on Calle Antonio Maceo, sells hot chocolate beverage, mousses, and bars, while the Fábrica de Cucurucho, on the west side of the bay, is a great place to buy cucurucho – a delicious mixture of pineapple, coconut, bee’s honey, orange and almendra. There’s no shortage of things to see and do hereabouts. The wild eastern shore is an untamed quarter with untapped opportunities for hiking and ecotourism. You can burn off the sugar with invigorating hikes to the summit of El Yunque, and in nearby Parque Nacional Alejandro de Humboldt, where colored snails – *polimitas – are unique to the region. Just getting to Baracoa is its own adventure as you ascend from Guantánamo via La Farola, a mountain road (initiated during the Batista era, when it was called the Vía Mulata) with nerve-wracking bends that switchback up and over the Sierra Cristal via the valleys of the rivers and Yumurí. And the Río Yumurí makes for a lovely sightseeing trip from Baracoa Boat trips are offered from the rivermouth up the river canyon. Beyond Yumurí, the coast road spirals up to the village of La Maquina (the name of that amazing and dangerous road it’s La Boruga), in the heart of an upland coffee-growing region. The village looks out over a vast coastal plain tipped by a lighthouse built in 1862 pinning **Punta Maisí, the easternmost tip of Cuba. Descending via a rutted track of red earth, you’ll eventually reach land where day breaks forty minutes before it occurs in Havana. **Note since 2004 it has been necessary to obtain government permission to enter certain areas here which is essentially reserved for certain research projects. *Polymita is a genus that inhabit many areas of the oriental region, Polymita picta it’s the specie that you can find only on Maisi and Baracoa forests).